I can't help but feel like Jenna is growing up too fast. She talks a mile a minute, is little miss independent "I can do it myself". She doesn't want help going to the bathroom anymore, and just looks older and older every day. I'm sure once her little cousin Allee arrives (in 5 weeks or so) she's going to seem like a giant. This morning she picked out a shirt to wear and I asked if she wanted to wear her tights or socks and she replied "um, I think the stripes would be just fine". That meant tights and a skirt. So I got her dressed, crocs included and she told me she wanted pigtails. 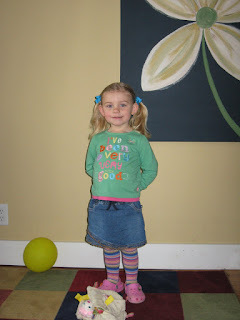 By the time she was ready to go she looked like she was off to her first day of school! Notice at the bottom of the picture you can see her little kitty wrapped up in her blankie. She loves wrapping up her animals and dolls, feeding them and reading to them. I think when little Allee arrives she is going to either be spoiled or traumatized by her big cousin!